This Amethyst necklace has brilliant, sparkly, faceted 6mm gemstone rondelles. The stones have an excellent quality, highly polished appearance. This stunning 18 3/4" chain of Amethyst has a gorgeous hand cast pendant of .925 Bali sterling silver with a round, brilliant, sparkly, faceted 11mm Mystic Quartz that displays shades of pink and purple in the light. 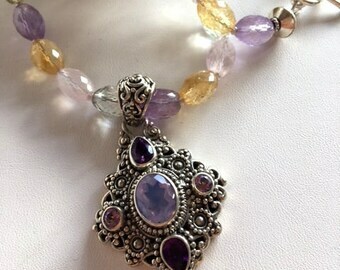 It is surrounded by four faceted 4mm Amethyst and is beautifully filigreed on both front and back. Truly a statement piece, this special necklace is sure to be a conversation piece. 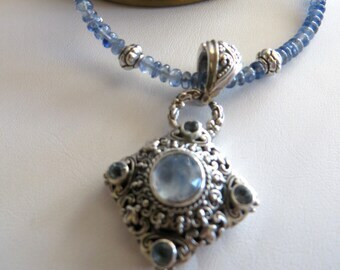 The necklace length is 18 3/4" and it fastens at the neck with an artisan toggle of sterling silver. 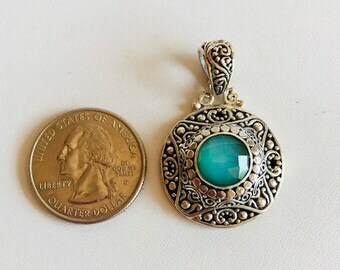 The pendant length including bail is 1 3/4" long x 1" wide. 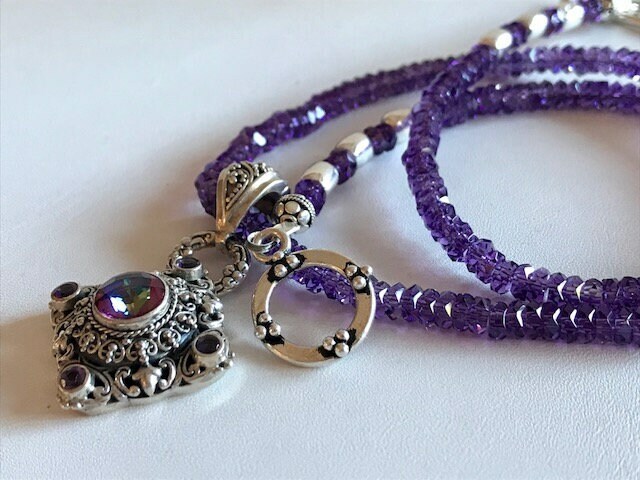 This pendant can be slid off the beaded chain and put on your favorite sterling silver chain (not included) for versatility and a completely different look. 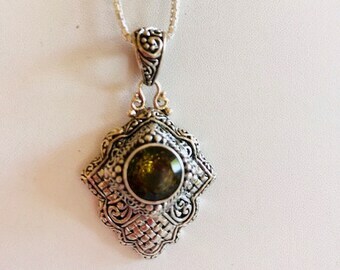 Fabulous Balinese .925 silver pendants are handcrafted in the village of Celuk, Indonesia by artisan silversmiths; the intricate designs are exotic and exquisite. * Amethyst is the most highly prized variety of Quartz and is the official birthstone for February. This stone is said to protect the wearer from drunkenness, and for this reason in ancient days, wine goblets were often carved from it. Western mystics say the stone helps instill the highest ideals and urges one to do what is right. They also claim Amethyst cures impatience, alleviates feelings of victimization, balances high energy, eliminates chaos and helps keep one grounded.